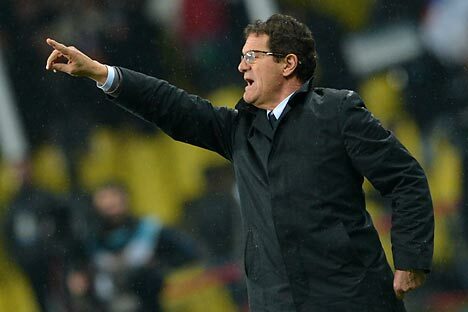 After a 100-percent start in qualifying rounds for the 2014 World Cup, Fabio Capello’s team is in ninth place, moving ahead of teams such as Greece, Croatia and Uruguay. The Russian national soccer team entered the Top 10 on the basis of updated FIFA ratings for October. Capello’s squad had been ranked 12th up until September, but, following their success in the 2014 World Cup qualifiers, they overtook their Euro 2012 rival Greece (who knocked Russia out of the tournament), as well as Croatia and Uruguay. In early October, Russia defeated both Portugal and Azerbaijan to lead their qualifying group with a 100 percent record. The win against Portugal was truly stunning, since the Portuguese team had been ranked number three in the world at that point, following a good summer. A loss to Russia at Luzhniki Stadium, coupled with a surprise draw against Paolo Bento’s Northern Ireland team, relegated the Portuguese to fourth place. They have been replaced at number three by Argentina. The Argentinian team has not lost a single point in their Brazil 2014 qualifying rounds since September, defeating Copa America winners Uruguay and Chile in their last two matches. Rounding up, Russia has collected 1,084 points over the last four years. The lion’s share of these was gained in the current season, during which the team piled up 606.68 points. Even if their exit from Euro 2012 was left out, this season can still definitely be called a success for the Russian team. The last time Russia appeared in the Top 10 was in October 2010, when they shot up from 15th place. They have been hovering just outside the Top 10 ever since, which is most likely due to playing meaningless friendlies at the start of last year (against Qatar, Iran and Cameroon) and the absence of clashes with top teams. The highest the Russian team has been ranked over the last four years is sixth, which Guus Hiddink’s players achieved in summer 2009, racking up 1,161 points and overtaking England, Argentina and France along the way. However, by October of the same year, they had already fallen out of the Top 10. There were only three teams that did not move at all in the top 30: Norway, Germany, and Spain (current World and European Champions). In the Top 10, the Italian team has moved up three positions, passing England for the hotly contested fifth place, while Uruguay has fallen four places.